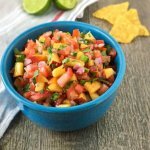 This fresh Peach Salsa recipe is made with sweet fresh peaches and is a great dip for tortilla chips. It also makes a delicious topping for fish or pork! Hey guys! First off, I want to let you know about some exciting changes that are coming to the blog. I’ve decided to change the name of my blog from The Texas Peach to something that better reflects what my blog is all about. The new name will be Healthier Dishes. I’ve already renamed my social media accounts, so if you follow me there, you may have noticed the change. Also in the works is a new blog design, which will be rolling out this week. I think it will be much easier to navigate the site and find recipes. The only thing that won’t change is my recipes. They will still be simple, healthy meals made with real food. I’m super excited about the new things coming and I hope you will be, too! Ironically enough, I am posting my very first recipe using fresh peaches. Totally fitting, don’t you think? Ha! 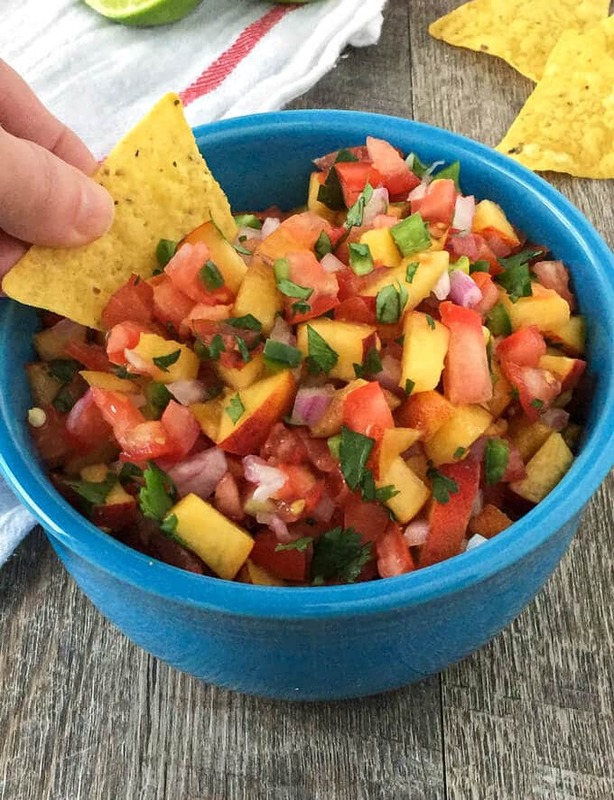 This Peach Salsa recipe is so amazingly good! It’s the perfect combination of sweet and spicy. You’ll want perfectly ripe peaches to make this salsa. Otherwise, it’ll just be really tart and not good at all. Here are some tips on how to pick a perfectly ripe peach. The heat level of this Peach Salsa will vary depending on the jalapeño and whether you use some or all of the ribs and seeds. I left half of the seeds and ribs in from a large jalapeño, and it was muy caliente! I leave the peel on the peaches when I make this. It looks prettier and you can’t even tell it’s there. Plus, you can skip the boiling and peeling steps that some recipes call for. I’ve done it both ways, and since you can’t detect the peel when you take a bite, it’s worth skipping for me. 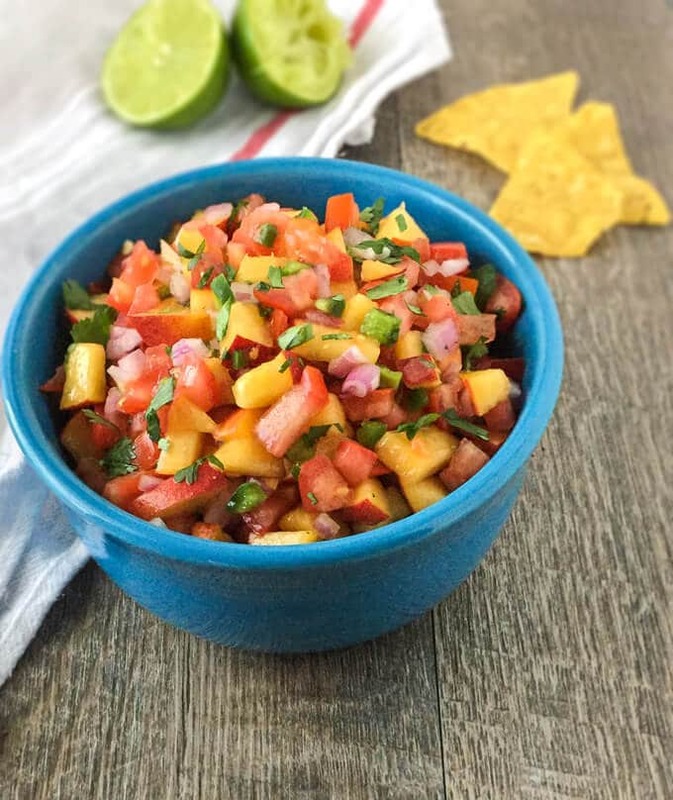 This Fresh Peach Salsa makes a tasty snack with tortilla chips or as a topping for grilled meats and fish. In a large bowl, add all of the ingredients and gently stir until well combined. Use a tortilla chip to taste test, then serve. Or if making a few hours ahead, cover and refrigerate until ready to serve. By Tempie at February 26, 2018 .